Posted on November 28, 2016 at 5:15 pm. After more than five weeks behind bars, three of the 18 Crown Casino employees detained in China have now been formally arrested. The Australian trio will face formal charges over violations of China’s strict gambling laws. Chinese Foreign Ministry spokesman Geng Shuang revealed no other information at the press briefing on Friday other than the fact that the arrests related to “suspicion of gambling” and that China would handle the case in accordance with the law. It is still unclear exactly what allegations the three Australians will face. The arrests were made after serious investigations took place over the past month as part of China’s major crackdown on gambling and corruption. Gambling is illegal in mainland China, so international casinos like Crown send agents to recruit high-rollers to come to Australia to gamble. Under Chinese law, agents are banned from organising groups of 10 or more to gamble abroad. No further information has been released about the status of the remaining detained Crown employees, the 15 of which are all Chinese residents. One of the arrested is Jason O’Connor, head of Crown’s International VIP team in Melbourne, who was detained during a visit to China. The other two arrested Aussies are believed to live in China. Australia Foreign Minister, Julie Bishop, has confirmed the arrests and says the three Australians are all in good health and are receiving assistance from Australian consular officials. She said all Australians should be aware of the laws for any country they are operating in. Crown Group has yet to comment on the arrests. 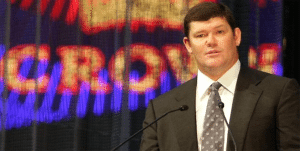 The company continues to suffer from the loss of high-roller revenue under China’s crackdown, with the fallout from the arrests expected to have a detrimental impact on Packer’s plans for the strictly VIP Crown Casino in Barangaroo, Sydney. It’d be un-Australian not to take a small amount of pleasure over anything that hurt James Packer and his billion-dollar empire, but it’s hard not to feel bad for the arrested Australians caught up in this mess. However, like Julie Bishop, we share the sentiment that any Australian who heads overseas, be it for work or for pleasure, should be fully aware and respectful of the laws of the country they’re entering. We just hope Packer is giving his employees the best lawyers possible (highly likely) and is concerned more about their personal circumstance than the impact on his business (highly unlikely). Stay up to date with the latest news about Crown Casino and the China arrests at OnlinePokieGame.com. Bookmark our site for all the latest in casino and pokies news, and the latest promotions being offered by online casinos.